Get back your healthy flowing hair with the ultimate nutrition set, the Revitalizing Care Set! This set nourishes the hair deeply, to restore dry or damaged hair. The Revitalizing Care Set is the super nourishing treatment to take care of natural hair. The revitalizing formula restores the hair’s vitality without adding weight to the hair. The Revitalizing Care Line is Paraben free and perfect for dry or damaged hair. 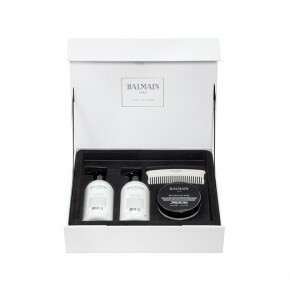 Enriched with the signature Balmain fragrance, this set gives a spa like experience and deeply nourished hair. The revitalizing formula includes a fine selection of vitamins E, F and P. The ultimate ingredients for shiny, healthy and lustrous locks. Use: Shampoo, condition and mask for the ultimate nourishing treatment. Use the Comb under or after the shower. The Comb is also a handy styling tool. Backstage Secret: Use the comb from the Revitalizing Care Set to comb your hair in the shower when you use the Revitalizing Mask. This to maintain healthy and easy to style hair. Start combing at the ends of the locks and work your way up.